The Intel MCS-85 development board #VintageComputing #History @Intel « Adafruit Industries – Makers, hackers, artists, designers and engineers! Each time Intel launched a new microprocessor, they simultaneously provided a System Development Kit (SDK) allowing engineers, university students, and others to familiarise themselves with the new processor’s concepts and features. The SDK single-board computers allowed the user to enter object code from a keyboard or upload it through a communication port, and then test run the code. The SDK boards provided a system monitor ROM to operate the keyboard and other interfaces. In addition, Intel sold a range of larger-scale development systems which ran their proprietary operating systems and hosted development tools –assemblers and later compilers – targeting their processors. Most of these were rendered obsolete when the IBM PC became a de facto standard, and by other standardised technologies such as JTAG. 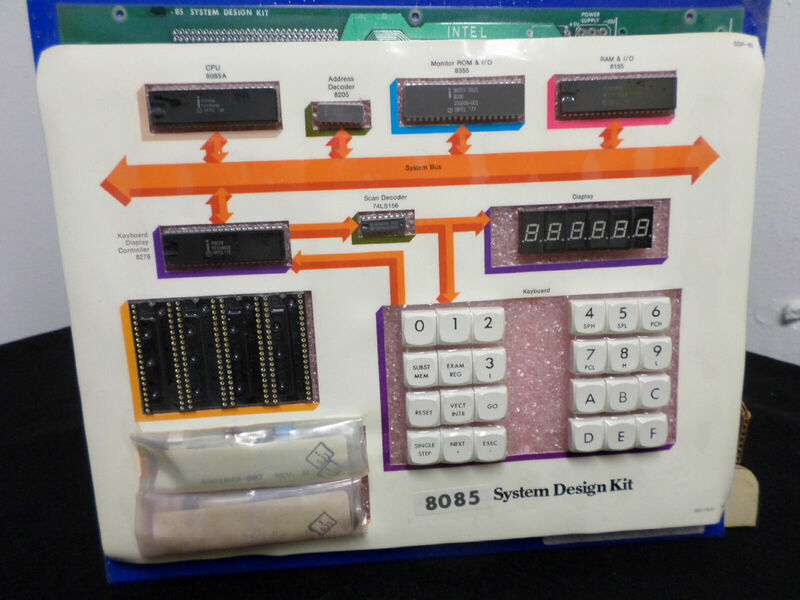 The SDK-85 MCS-85 System Design Kit was a single board microcomputer system kit using the 8085 processor, clocked at 3 MHz. It contained all components required to complete construction of the kit, including LED display, keyboard, resistors, caps, crystal, and miscellaneous hardware. A preprogrammed ROM was supplied with a system monitor. The kit included a 6-digit LED display and a 24-key keyboard for direct insertion, examination, and execution of a user’s program. It also had a serial transistor interface for a 20 mA current loop Teletype using the bit-serial SID and SOD pins on the CPU. The maximum user RAM for programs and data, on the factory standard kit, was limited to 0xC2 or 194 decimal bytes. The full 256 bytes was available on the expansion RAM. User programs could call subroutines in the monitor ROM for functions such as: Serial In/Out, CRLF, Read Keyboard, Write Display, time delay, convert binary to two character hexadecimal etc. These kits provide an interesting look into how Intel looked to get working systems in the hands of developers and students. Such systems were slowly phased out,as tools like the IBM PC became available to provide a host for communications with development boards and and providing cross-assembly tools. Did you use Intel development boards? Let us know in the comments below. I still have one and it still works.